Question - Define the term marketing mix. Explain structure of marketing mix and its elements. Marketing is the process of identifying, anticipating, and satisfying customers' requirements with the purpose to make profits. In this process marketing managers and marketing representatives have to take various marketing decisions to make the operations profitable. They have to decide what combination of marketing policies and procedures be adopted to bring about desired behaviour of trade and consumers at minimum cost. They have to decide how can advertising, personal selling, pricing, packaging, channels, warehousing, and the other elements of marketing be manipulated and mixed to make marketing operations profitable. More specifically, they have to decide a marketing mix - a decision making method in relation with the product, price, promotion, and distribution. The term Marketing Mix was introduced by Neil H. Borden in his article - "The Concept of Marketing Mix". He learned about it in a research bulletin on the management of marketing costs, written by his associate, Prof. James Culliton. in 1948. In this study of manufacturers' marketing costs he described the business executive as a "decider," an "artist" - a "mixer of ingredients," who sometimes follows a recipe prepared by others, sometimes prepares his own recipe as he goes along, sometimes adapts a recipe to the ingredients immediately available, and sometimes experiments with or invents ingredients no one else has tried. 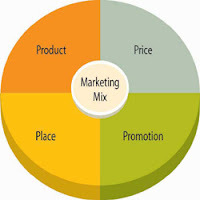 According to Philip Kotler - "Marketing Mix is the combination of four elements, called the 4P's (product, Price, Promotion, and Place), that every company has the option of adding, subtracting, or modifying in order to create a desired marketing strategy"
According to Principles of Marketing, 14e, Kotler and Armstrong, 2012 - "The Marketing Mix is the set of tactical marketing tools - Product, Price, Promotion, and Place - that the firm blends to produce the response it wants in the target market." The Marketing Mix is a marketing tool used by marketing professionals. It is often crucial when determining product or brand's offering, and it is also called as 4P's (Product, Price, Promotion, and Place) of marketing. However, in case of services of different nature the 4 P's have been expanded to 7P's or 8P's. In recent times, giving more importance to customer a new concept have been introduced, i.e. Concept of 4C's. The Concept of 4C's is more customer-driven replacement of 4P's. According to Lauterborn's the 4C's are - Consumer, Cost, Communication, and Convenience. According to Shimizu's the 4C's are -Commodity, Cost, Communication, and Channel. Product - Products are offerings that a marketer offers to the target audience to satisfy their needs and wants. Product can be tangible good or intangible service. Tangible products are goods like - cellphone, television, or motor car, whereas intangible products are services like - financial service in a bank, health treatment by a doctor, legal advice of a lawyer. Price - Price is the amount that is charged by marketer of his offerings or the amount that is paid by consumer for the use or consumption of the product. Price is crucial in determining the organization's profit and survival. Adjustments in price affects the demand and sales of the product. Marketers are required to be aware of the customer perceived value of the product to set the right price. Promotion - Promotion represents the different methods of communication that are used by marketer to inform target audience about the product. promotion includes - advertising, personal selling, public relation, and sales promotion. Place - Place or distribution refers to making the product available for customers at convenient and accessible places. In case of services, the producer-oriented model of marketing mix is consists of 7P's. Including the above 4P's there are additional 3P's - Physical Evidence, People, and Process. Physical evidence refers to elements like uniform of employees, signboards, and etc. People refers to the employees of the organization comes in contact with the customers in the process of marketing. Process refers to the systems and processes followed within organization. Consumer - In this model the Product is replaced by Consumer. Marketers focuses more on consumer satisfaction. The product is designed and produced keeping in consideration the requirements of consumer. Cost - Price is replaced by Cost. Here the cost refers to the total cost of owning a product. It includes cost to use the product, cost to change the product, and cost of not choosing the competitor's product. Communication - Promotion is replaced by Communication. Communication includes advertising, public relation, personal selling, and any method that can be used for proper,timely, and accurate communication between marketer and consumer. Convenience - Place is replaced by Convenience. it focuses on ease of buying, convenience in reaching to the store/product, and convenience in getting product information. thatx allot ..your hard work helped me ..n saved me.....!! !